I look forward all year for the blueberries to ripen just so I can drag the kids out multiple times to pick pounds and pounds of blueberries both to be eaten fresh and to freeze for our enjoyment during the long, cold winters. This year's harvest is apparently amazing so the moment I saw the signs out in front of our favorite blueberry farm, I was itching to get the kids over there to pick us some berries. So, naturally, I planned for us to go on what turned out to be the hottest day of the summer thus far. I figured if we went as soon as the fields opened that we could avoid the intense heat of the day. First off, I had a very difficult time getting the children moving in the morning. Matthew readily went upstairs to get changed, but kept coming down dressed completely inappropriately for the day. The first time, he came down wearing sports pants. Pants! It was already 85 degrees and climbing! I sent him back with the strict instructions to wear shorts. He comes back down sporting his coonskin cap and a pair of shorts that were so over-sized, he struggled to keep them from sliding off his skinny little rump. I told him to go upstairs and put shorts on that fit him. This started a fit of whining, "But MOM! I want to dress like Davy Crockett!" to which I yelled back, "I'm sure Davy Crockett wore pants that fit him now GO CHANGE!" The things you never thought you'd hear yourself say. So, due to wardrobe changes and other excuses to dawdle, it was 10:00 AM and 90 degrees when I finally wrangled all the protesting children into the car and began the 20 minute drive to the farm. 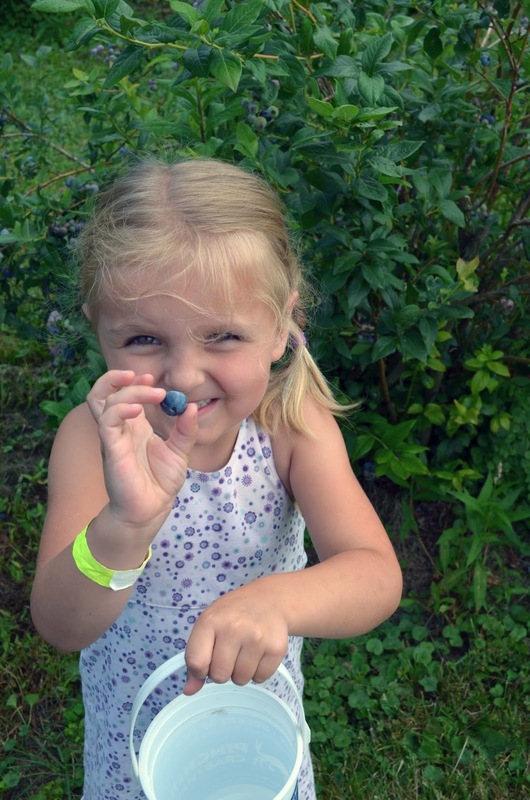 When we arrived and the kids had claimed their buckets of various sizes, we headed out in search of a remote portion of the blueberry patch with abundant berries. After a bit of a walk in, we found a great spot and started picking. The children were quite enthusiastic at first, but their energy quickly waned as the sun and humidity began to take their toll. Lucy was the first to give up, throwing down her little bucket (filled with only about 10 under-ripe berries) and demanding that I pick her up. I couldn't because I was balancing a gigantic bucket around my neck as well as my camera because I didn't want to miss an opportunity for some precious family photos, laughable now since they all look fairly miserable in the five pictures I did manage to take. After about 15 minutes of picking, Emma was also ready to throw in the towel and sat down to just eat the blueberries she picked. Matthew also began to wig out because a June bug flew in his face. I was the only one still picking at this point, limping from bush to bush with an extra appendage in the form of my 2-year-old wrapped around my leg. At this point we had picked maybe a pint of berries which was hardly worth our visit! And then from between the bushes came my guardian angel in the form of an elderly woman with a full bucket of berries. "Your children are darling!" she told me in greeting, "I had seven of my own and taking them out anywhere in the summer heat is quite the chore." 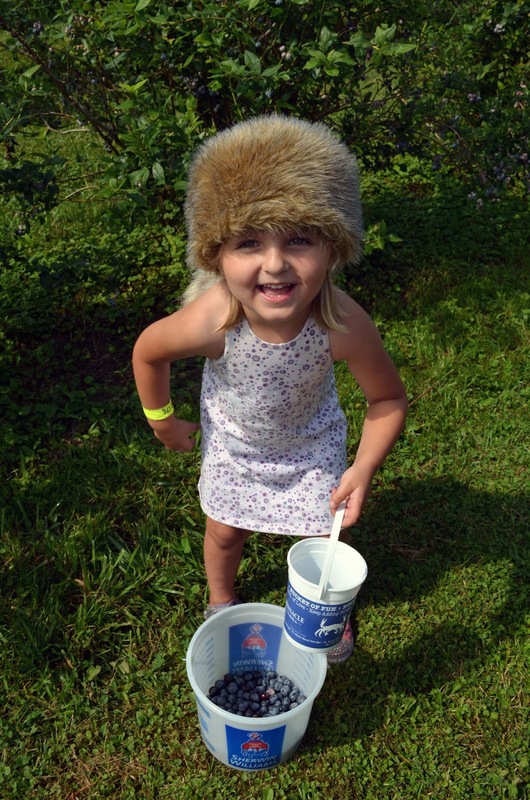 She then asked me to switch buckets with her, handing me hers that was filled-to-the-brim: "Go ahead and take it. It's a lot of work picking berries but way more difficult with children. I remember those days!" So we switched buckets and, after thanking her profusely, we headed back to pay for them. The kids were overjoyed. It was just too hot. Her act of kindness and compassion was greatly, greatly appreciated! 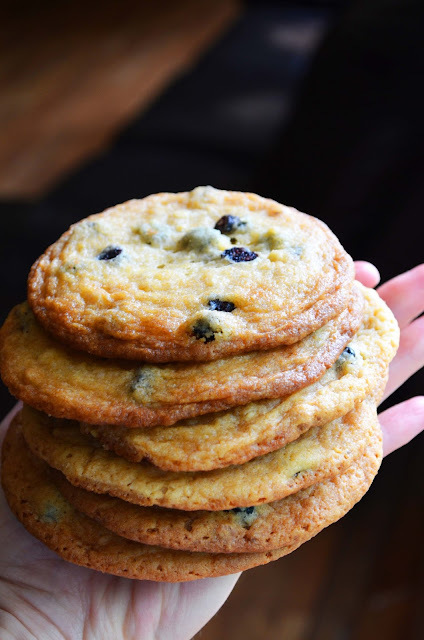 In honor of the start of blueberry season, I am sharing our favorite cookie recipe - Blueberries and Cream Cookies. Perhaps this isn't the best recipe to share to celebrate blueberry season since it requires dried blueberries instead of fresh, meaning you can't use all those big, beautiful, berries from the local fields or farmers markets unless you dehydrate them yourself (but really, who has time for that?). 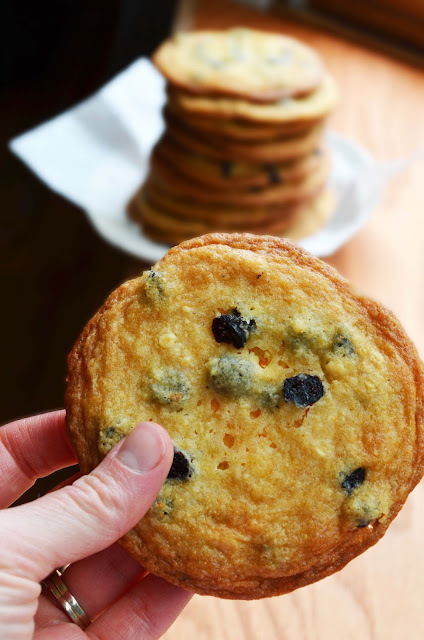 Thankfully dried blueberries are readily available year-round at any well-stocked grocery store meaning you can make these at any time, blueberry season or not. And you're going to want to because these cookies are amazing. This is another recipe from the genius of Christina Tosi. This was the cookie I chose to try at her famed Milk Bar in NYC. Paul and I had originally agreed to share our cookies, but after taking one bite I knew that he wasn't getting any of it - it was that good! Naturally, I made a couple batches of this cookie from her cook book as soon as we got home and Paul agreed that it was his new favorite cookie recipe. 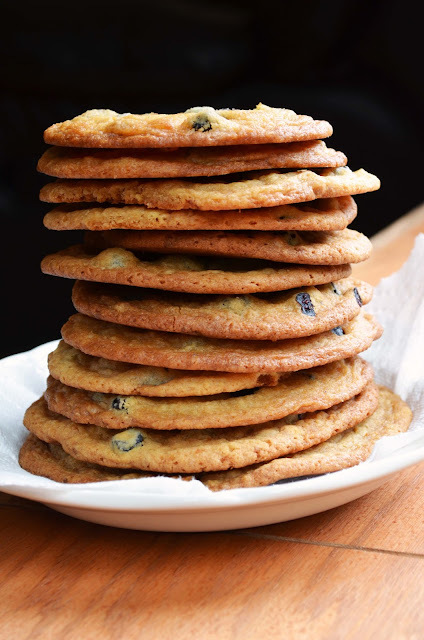 While the recipe itself is a bit more involved than the average cookie recipe - requiring an extra long beating of the batter in order to properly beat all that fat and sugar into submission and give the cookies some body otherwise the cookies have a tendency to spread. I have also found that using a flour with a little extra protein also helps give the cookies a bit more height. Otherwise, these are the chewiest, tastiest, most excellent cookies around. The milk crumb is pure genius and I have always been a huge fan of white chocolate and any fruit - fresh or dried! Take the extra time to make these. 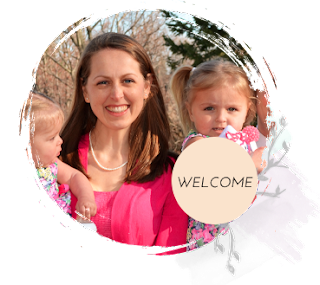 They will certainly be worth your while! Note: For best results, weigh all of your ingredients. Glucose can be found at most craft stores, believe it or not, or online. You can substitute corn syrup for the glucose and, while acceptable, the cookies themselves do not come out as gloriously chewy. Combine the 20 g (¼ cup) milk powder, the flour, cornstarch, sugar, and salt in a medium bowl. Toss with your hands to mix. Add the melted butter and toss, using a spatula, until the mixture starts to come together and form small clusters. Spread the clusters on a parchment-lined sheet pan and bake for 20 minutes. The crumbs should be sandy at that point, and your kitchen should smell like buttery heaven. Cool the crumbs completely. Crumble any milk crumb clusters that are larger than ½ inch in diameter and put the crumbs in a medium bowl. Add the 10 g (2 tablespoons) milk powder and toss together until it is evenly distributed throughout the mixtures. Pour the white chocolate over the crumbs and toss until your clusters are coated. Continue tossing them every 5 minutes until the white chocolate hardens and the clusters are no longer sticky. The crumbs will keep in an airtight container in the fridge or freezer for up to 1 month. Combine the butter, sugars, and glucose in the bowl of a stand mixer fitted with the paddle attachment and cream on medium-high for 2 to 3 minutes. Scrape down the sides of the bowl, add the eggs, and beat for 7 to 8 minutes. Reduce the mixer speed to low and add the flour, baking powder, baking soda, and salt. Mix just until the dough comes together, no longer than 1 minute. (Do not walk away from the machine during this step, or you will risk overmixing the dough.) Scrape down the sides of the bowl with a spatula. Still on low speed, add the milk crumbs and mix until they’re incorporated, no more than 30 seconds. Chase the milk crumbs with the dried blueberries, mixing them in for 30 seconds. Using a 2 ¾-ounce ice cream scoop (or a ⅓-cup measure), portion out the dough onto a parchment-lined sheet pan. Pat the tops of the cookie dough domes flat. Wrap the sheet pan tightly in plastic wrap and refrigerate for at least 1 hour [I did overnight], or up to 1 week. Do not bake your cookies from room temperature—they will not bake properly. When ready to bake, heat the oven to 350° F.
Arrange the chilled dough a minimum of 4 inches apart on parchment- or Silpat-lined sheet pans. Bake for 18 minutes, checking after 15 to ensure that you do not overbake them! The cookies will puff, crackle, and spread. They should be very faintly browned on the edges yet still bright yellow in the center. Cool the cookies completely on the sheet pans before transferring to a plate or to an airtight container for storage. At room temp, the cookies will keep fresh for 5 days; in the freezer, they will keep for 1 month.